The example below illustrates the basic concept. Two nodes (vertices) connected by a single edge (relationship). When reading up on graph computing you may notice that the words Node and Vertex are used interchangeably. It is important to note that there is no difference between them. With that in mind, from here on in I will stick with Vertex as this is the terminology seen throughout the Gremlin query language used by Azure Cosmos DB. 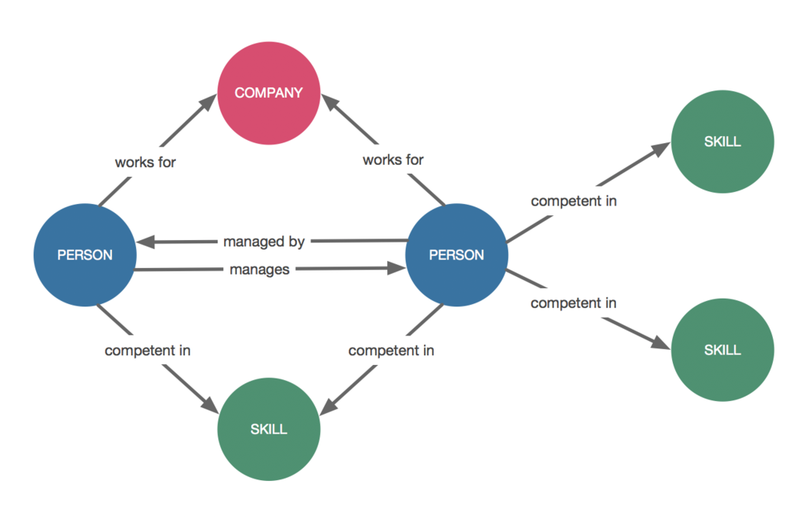 Why should I use a graph database? Highly connected data models where relationships are critically important (if not more important) than the nodes themselves, typically benefit from being stored and queried from graph databases. Traditional databases tend to slow down when handling data that is relationship intensive (i.e. many joins) whereas graph databases remain highly performant. 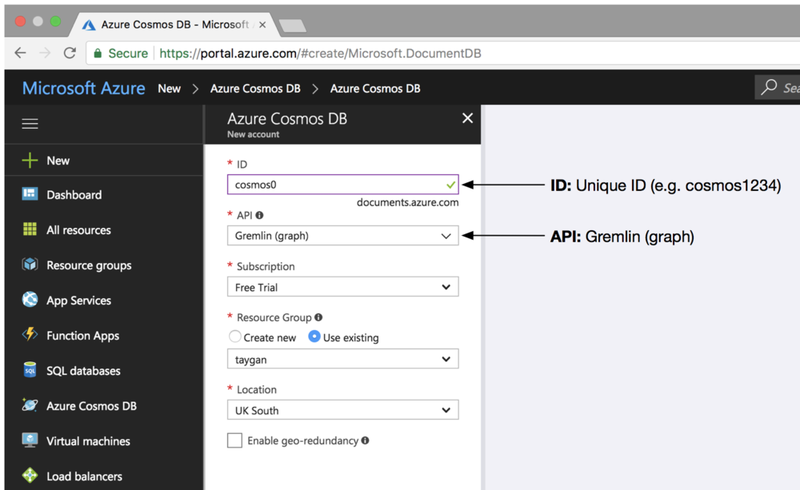 To get started you will need to create an Azure Cosmos DB account with the API set to Gremlin (graph). Gremlin is the graph traversal language of Apache TinkerPop (an open-source graph computing framework). 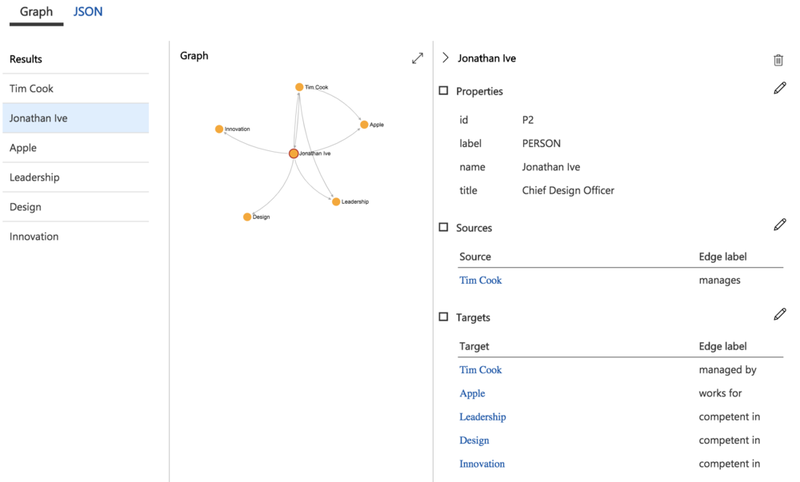 Once the resource has been successfully deployed, launch Data Explorer and create a new graph. We will be using the gremlinpython library to programmatically load our graph database. In this example, I am using Python 3.6.1 and gremlinpython 3.2.6 (Note: There seems to be an incompatibility issue with Cosmos DB and the latest release of gremlinpython which is 3.3.1 at time of this post). Create a new file (e.g. graph.py) and add the following code. Your primary key can be found in the Azure portal under Cosmos DB > Keys. Two people (Tim and Jonathan) work for a company called Apple. Tim and Jonathan have Leadership as a common skill. Jonathan is also competent in Design and Innovation. In our python file, we will be executing gremlin queries. While the language syntax is quite descriptive, you may want to head over to Apache TinkerPop's Getting Started to get a basic understanding of the commands. The code below contains queries to create our Vertices and Edges as described in our scenario as an array of strings. Purge the graph database of any existing content. If successful, navigate back to Cosmos DB > Data Explorer > Database > Collection and execute the command g.V() to return the graph and see the results visualised. If we focus on a particular vertex, we can get a summary of the Properties, Sources and Targets. Now that we have some data we can query and traverse our graph. So all this is well and good but how can we apply this in the real world? Social Networks - Facebook, LinkedIn, Snapchat, Twitter. Recommendation Engines - Airbnb, Netflix, Expedia. Human Capital Management - e.g. Vacancy can be filled because Person A has competencies in Skills X. Impact Analysis - Networks, Data Lineage. Fraud Detection - Find patterns in data that do not align with expected behaviors. Hopefully this gives you some insight into graph databases, what they are, and how they can be leveraged to derive value out of highly connected data.